The FHXB Friedrichshain-Kreuzberg Museum was able to implement and complete a digitization project from 2013 to 2015 with funds from the EDRF (European Regional Development Fund), in which five different collections from the archive were digitized and put online. The largest of these collections concerns “urban renewal and social movements in Kreuzberg in the seventies until the nineties,” in which an assortment of brochures, surveys, and reports from architects and city-planners, stemming from the International Architecture Exhibition (IAE/IBA), can be found. Documents concerning civic engagement projects, flyers, posters, and neighborhood papers make up another fundamental part of this collection. Additionally, artifacts concerning immigration to Friedrichshain and Kreuzberg, a collection from the exhibit on the history of Jews in Kreuzberg from 1991, an array of items about the artists’ circle “Kreuzberger Boheme,” as well as a collection of scrapbooks of Friedrichshain from the GDR, were all digitized. In the summer of 2015, the museum then received a collection on urban renewal with photographs from the same period, provided by the S.T.E.R.N. society, which complimented existing documents. This gift included 370 boxes of journals, each with 24 framed image slides in a 25 x 36 mm format and a card file made up of eight small boxes with a total of 1,296 affixed black-and-white photographs – a total of nearly ten thousand photographs. The collection illustrates the development of the renovation area in Berlin-Kreuzberg during and after the urban renewal and renovation project of the city from the late seventies to the early nineties. This collection was digitized and made accessible to the public with the support and funds of the administration for cultural matters of the Berlin Senate. In 2017, the museum digitized and published a stock of 25,000 photographic negatives from Jürgen Henschel (1923–2012). As a press photographer for the German daily Die Wahrheit of the Socialist Unity Party of West Berlin (SEW), Henschel documented events in the city, big and small: political protests and meetings, the arts and culture scene, commemorative events as well as the everyday lives of “regular people.” The city’s transformation is sometimes positioned as a backdrop, sometimes in the foreground – through decay and ruin, new construction, or restoration. In this way, the already digitized collections are deepened and enriched by the rich photographic documentation of often overlapping places and events. This project was made possible by the financial support of the administration for cultural matters of the Berlin Senate. 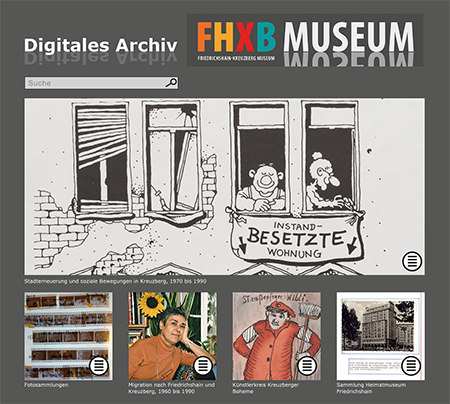 In addition to access to the digital archive through the FHXB Museum, digitalized resources are also available through the portals of museum digital, Deutsche Digitale Bibliothek, and EUROPEANA.